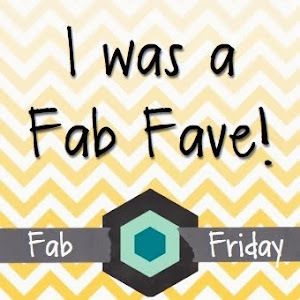 I'm here with Retro Rubber Challenge Blog today and we have a new inspirational challenge. Here is the picture below. 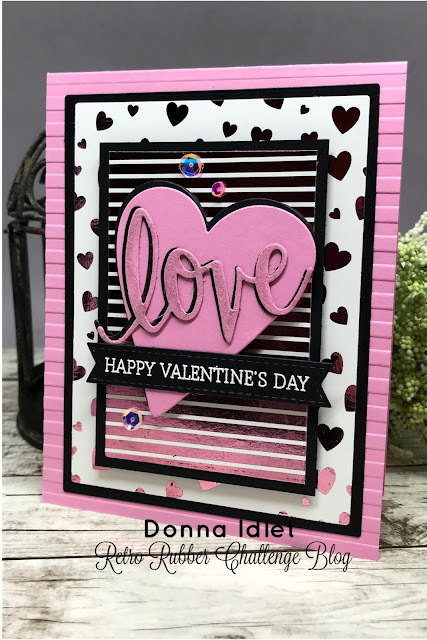 And here is my take on the inspirational photo, it's all about "LOVE", and I have added some foiling and sparkle to my card! I hope I have inspired you and you will play along with us. 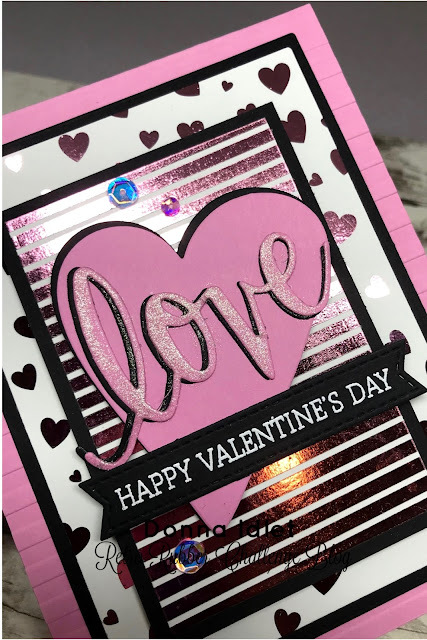 Here is a closer look at my card, I added some clear Wink of Stella to give the word "love" sparkle. Are you ready to play along? The rules to play along with Retro Rubber are very simple, make sure the stamp you use on your project is at least one year or older. 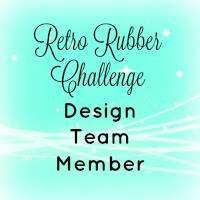 For more details on the rules, you can find them over on Retro Rubber Challenge blog. Be sure to stop over on the Retro Rubber Challenge blog to get more inspiration, the design team has some wonderful creations! Thank you for stopping by, you have until February 9th to join the fun! 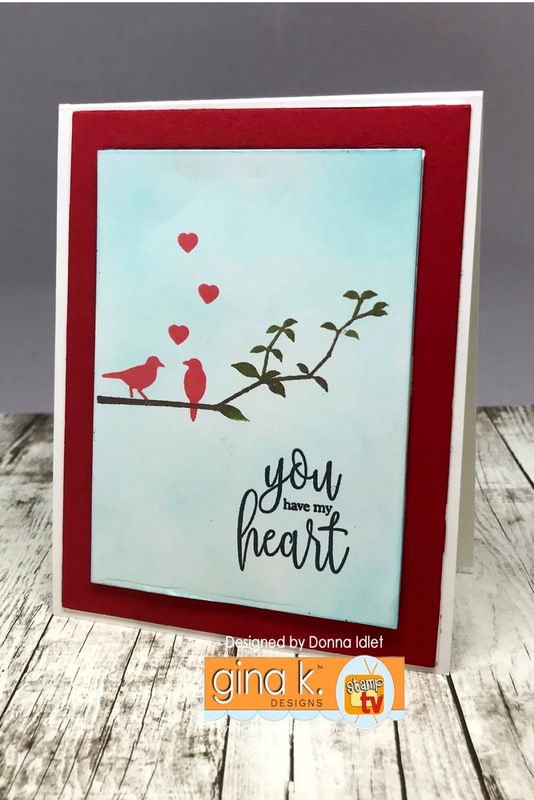 I am stopping by to play along with this months "Monthly Mix Challenge" over at StampTV. If you have not had a chance to play along thfere are a few more days to join. 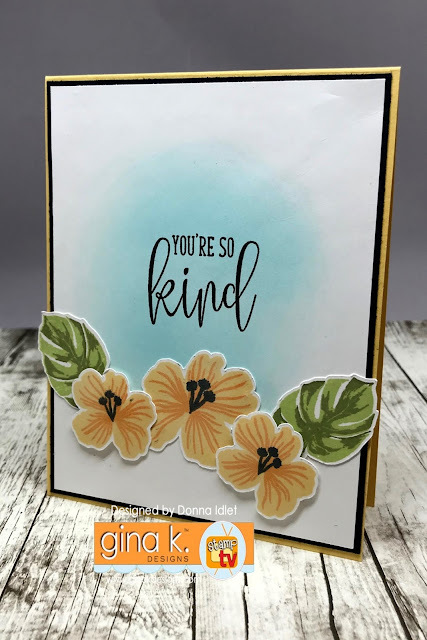 You don't want to miss out because Gina K. Designs will be giving a $75.00 Gift Certificate to One Winner each month!Karen Hightower is this month's hostess and she is challenging us with a "Kindness" theme. You can find all the challenge details HERE. Here is my card, I am using the newly release, Gina K. Designs Foil-Mates™ Sentiments Lovely Tags. 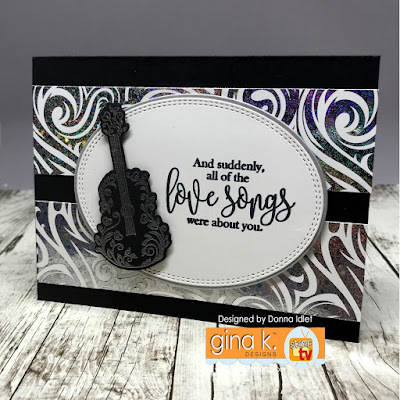 If you have not seen Gina K.'s foils, you can find them all here. 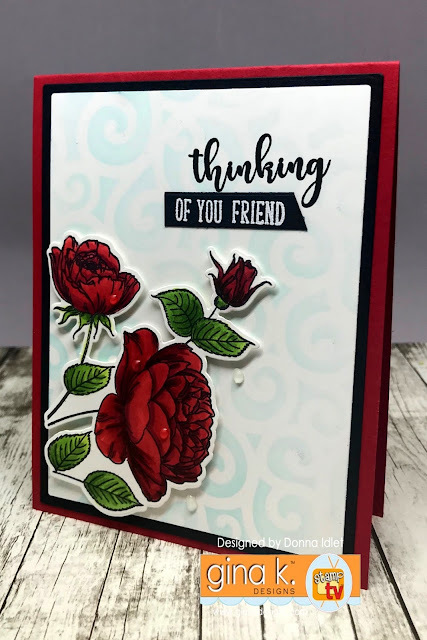 The foil I used on my card is the Gina K. Designs Fancy Foils™ 6" x 8" - Red Velvet. 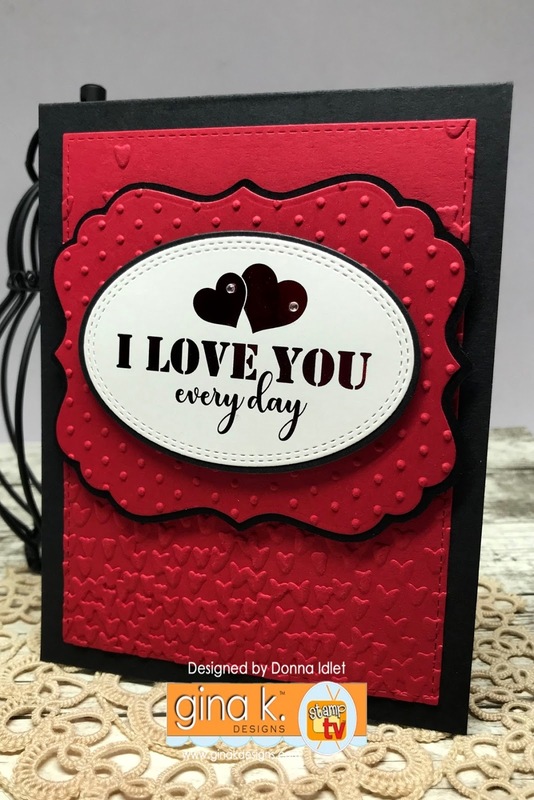 My card is an A2 card, I die cut the first layer and embossed it with a heart embossing folder. I then die cut the scalloped frame with Gina K. Designs decorative labels die, I then foiled the sentiment from the Gina K. Designs Sentiments Lovely Tag, and used the Gina K. Designs Double Stitched Ovals Dies. I adhered the decorative label and the oval stitched dies to my card with some foam tape. Thank you and stop by again soon! 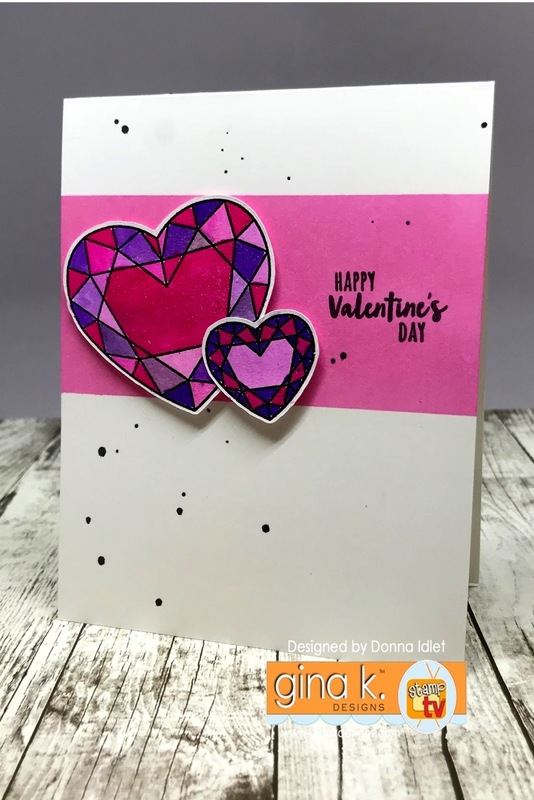 I'm listing the products I used for this card. 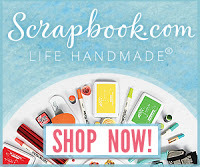 Click on the link to go directly to the product. 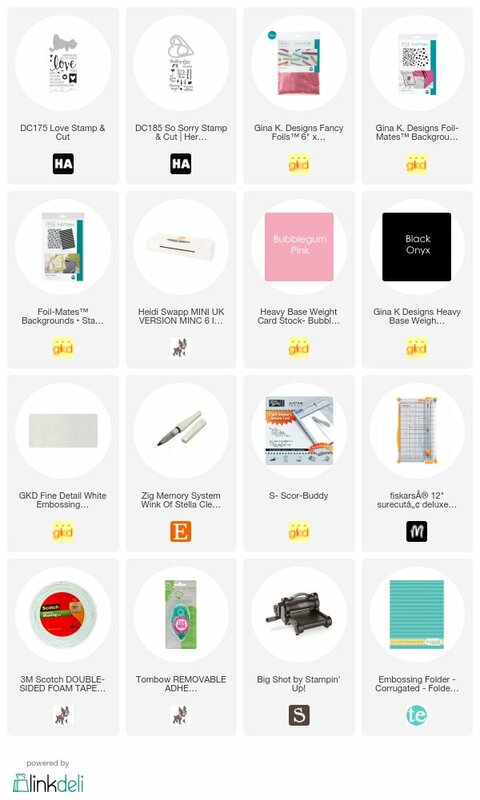 Where available I use compensated affiliate links which means if you make a purchase I will receive a small commission at no extra cost to you. Thank you so much for your support! 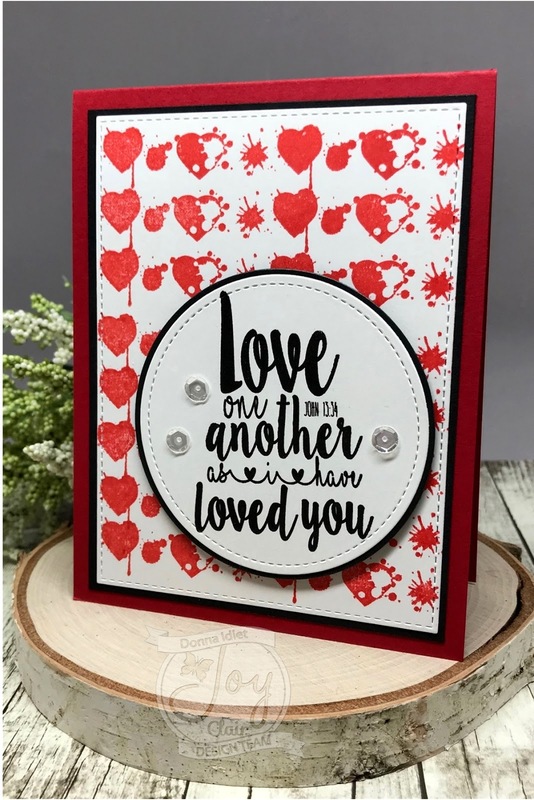 I am back again with Joy Clair featuring two of the newly released stamp sets, The background stamp is called "Valentine Background" from the Everyday Collection and the sentiment is from the stamp set "Scriptures of Love" which is from the Color by Faith Collection. 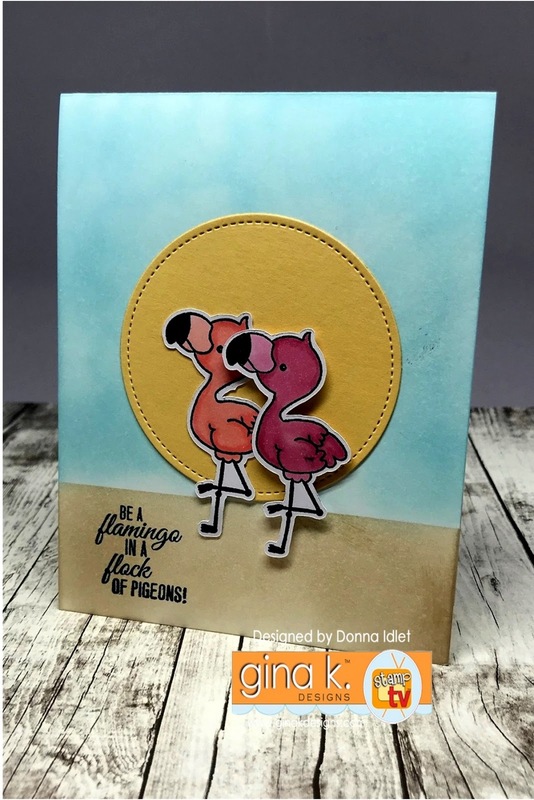 I love the background stamps because you can create your background with one of the stamps or mix and match. 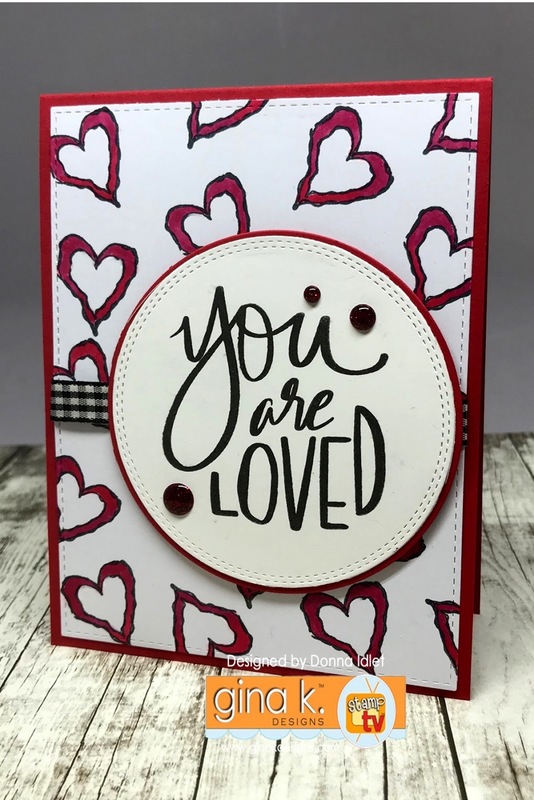 The Scriptures of Love set is so versatile....you can use them in your bible journaling or make cards like I did. Here is how I put my card together! 4. I finished the card off by adding foam tape to pop the sentiment on my card and added some clear sequins. 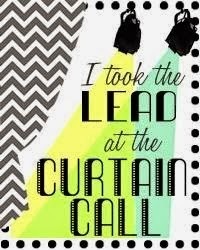 and Twitter, Pinterest and Youtube channel to be the first to hear the news, sales and giveaways! 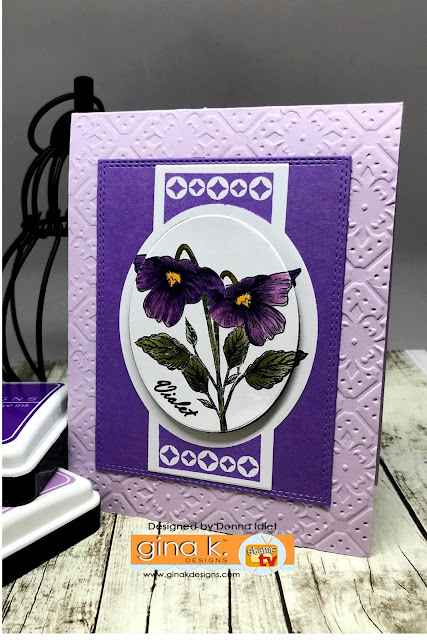 Thank you for stopping by, Ii hope you have been inspired to want to use these stamp sets. Please come back again soon! 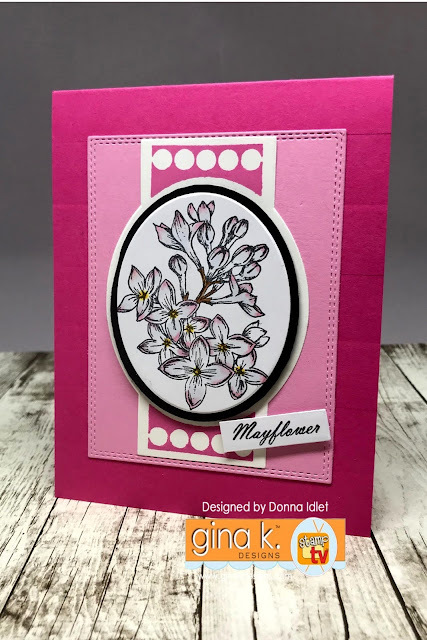 Welcome back to the last blog hop featuring the new Gina K. Designs Hearts & Flowers StampTV Kit and the new Incentive stamp set, You Get Me! 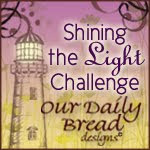 We hope you have been inspired the last two days! I know I have enjoyed seeing all the beautiful creations of the design team. This new Kit is full of fun stamps, paper and dies to create with! 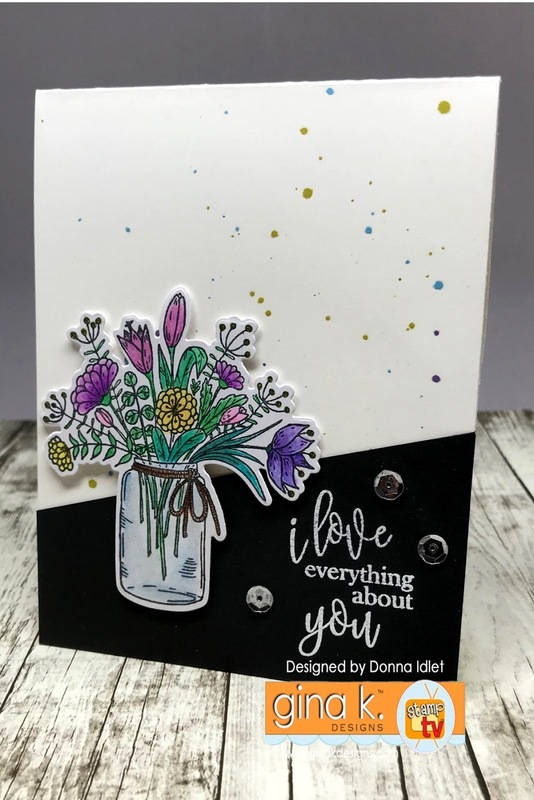 There are two Stamp sets one is called "Tropical Blooms" and the other is called "You Have My Heart". Don't wait to long to get your kit, I have a feeling this one will sell fast! 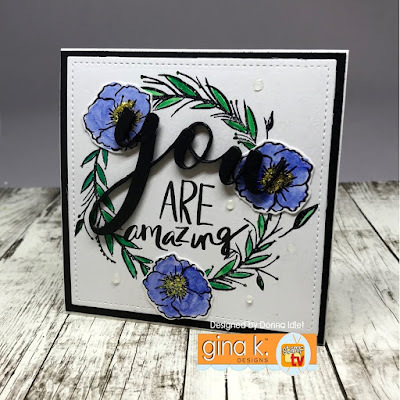 Gina K. Designs has a giveaway during the hop! Just comment on each team members blog for your chance to win. 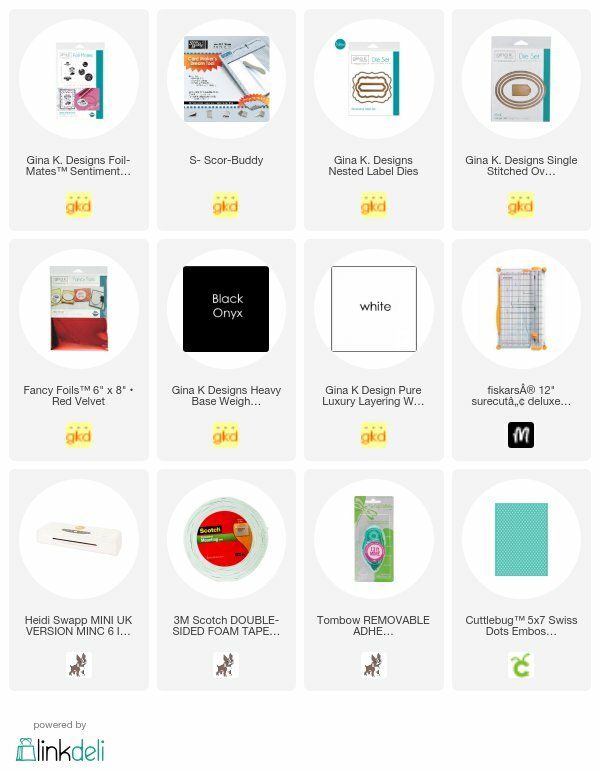 Gina K. Designs will be giving away THREE $25.00 gift Certificates for the Gina K. Designs store. The winners will be announced in the big news over at StampTV a few days after the hop. Don't forget you have a chance to win one of THREE $25 Gina K. Designs gift cards for just commenting on each team members blog. The winners will be announced in the big news over at StampTV a few days after the hop. Did you miss the Release Party a couple of weeks ago? 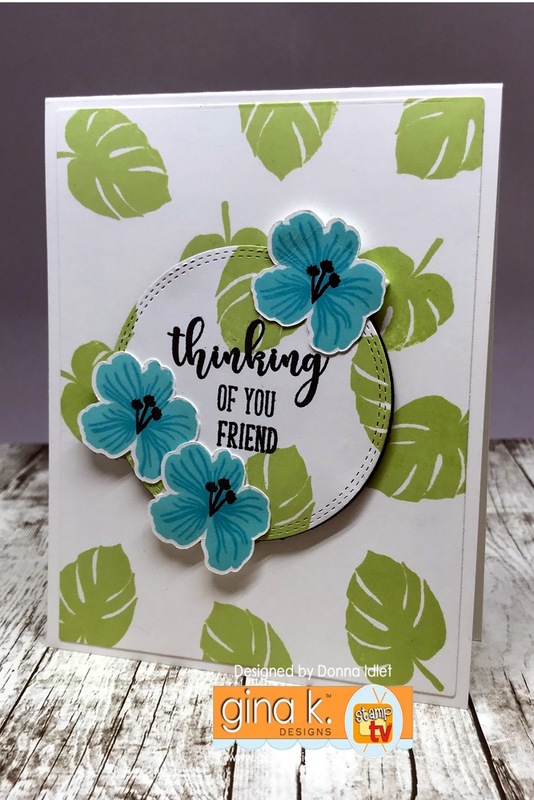 Here are a another card I showed. 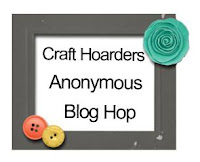 Below is the blog hop list, please stop by and leave a comment on each blog for a greater chance to win a $25 gift card to the Gina K. Store. 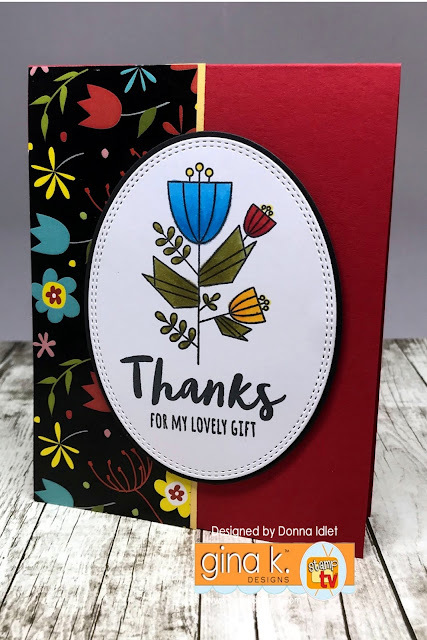 Thank you so much for stopping by, I hope you have enjoyed the inspirational blog hop this week. Please come back again soon. 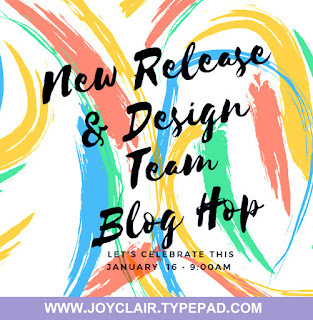 Joy Clair January New Release and Blog Hop! 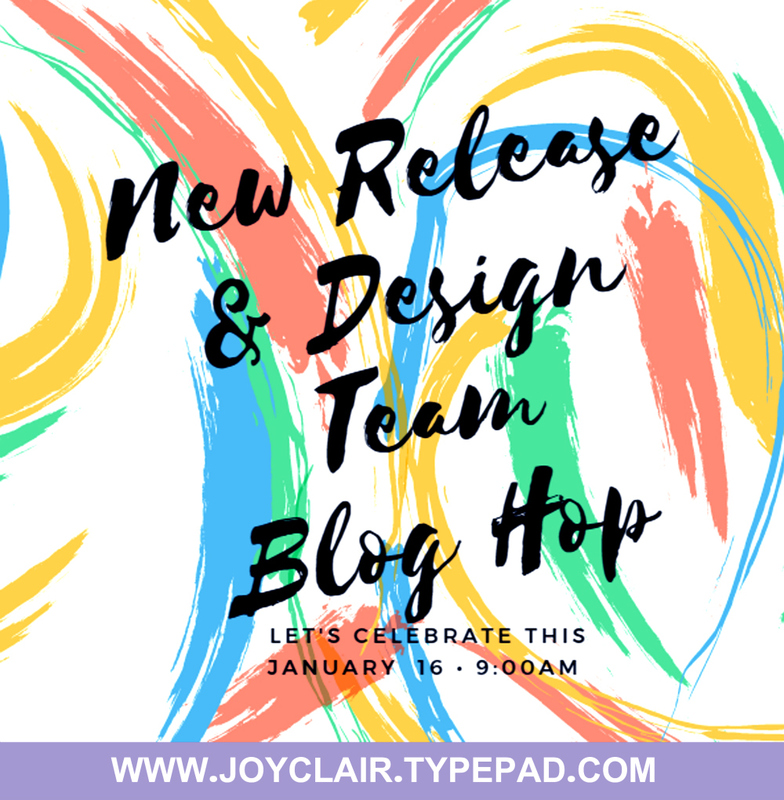 Welcome to the Joy Clair January 2018 New Release and Blog Hop! 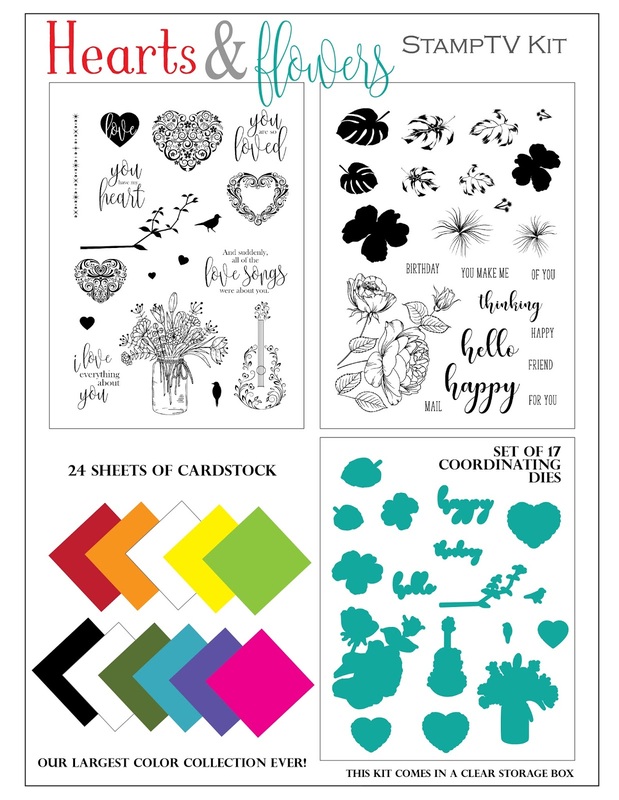 The design team has been working hard creating a variety of projects that are sure to spark your creativity juices! 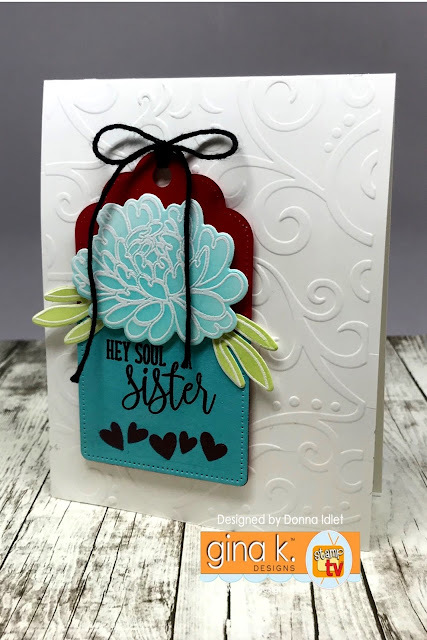 You should be arriving from the talented Helen Gullet blog. 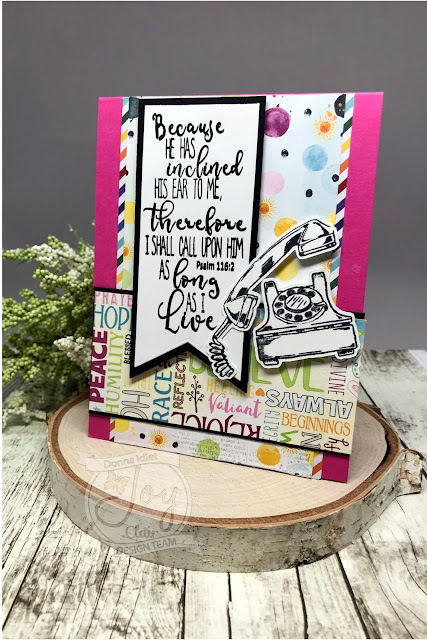 Joy Clair’s January release contains six everyday stamp sets and seven stamp sets from their new bible journaling line, There is a $25.00 gift card up for grabs for one lucky winner for commenting on each designers blog and tell us what your favorite stamp set is. 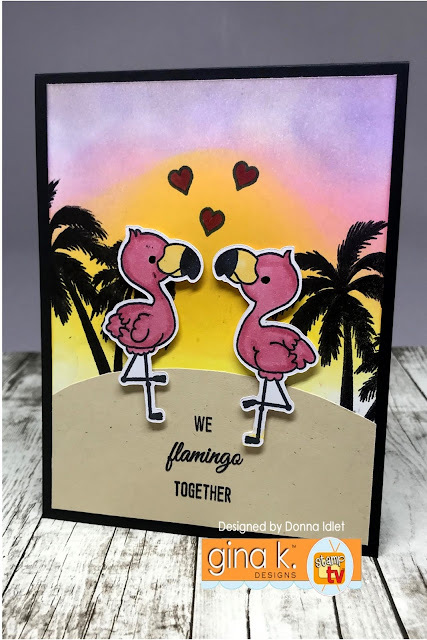 Here is my card and how I put it together! 4. 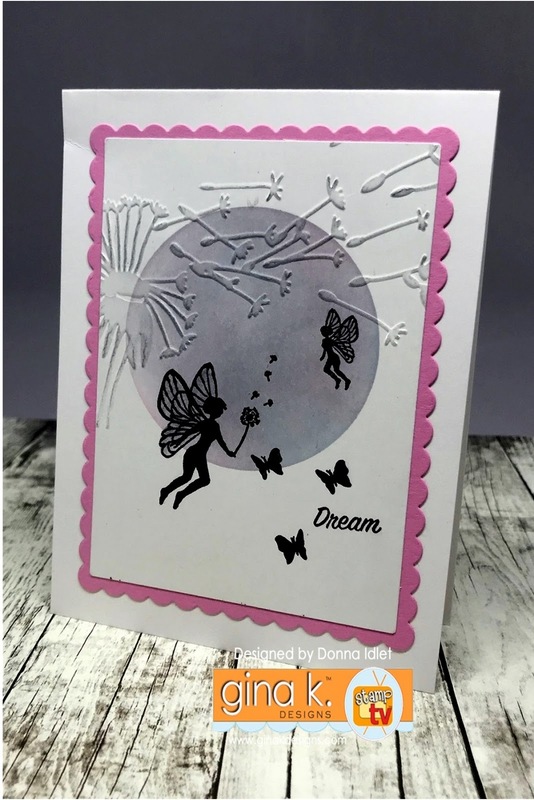 I cut the layers out and adhered them to my card and added the elements from the stamp set on it with foam tape. Let the fun begin! 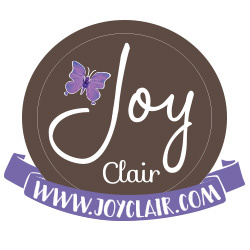 Remember Joy Clair always has a giftcard to the Joy Clair store for those who comment on each blog and leaves a comment. 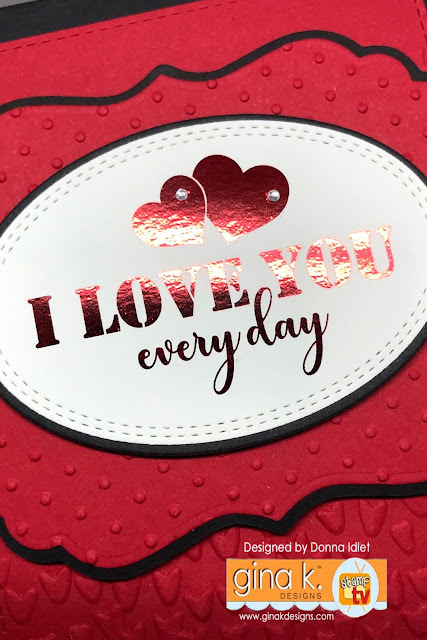 You also need to tell us what is your favorite stamp from the new release. 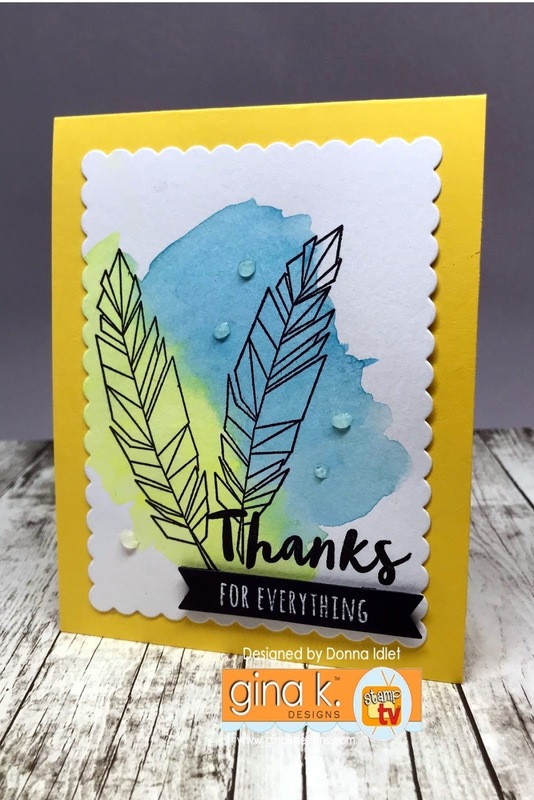 Thank you for stopping by, I hope you will be inspired after the blog hop! 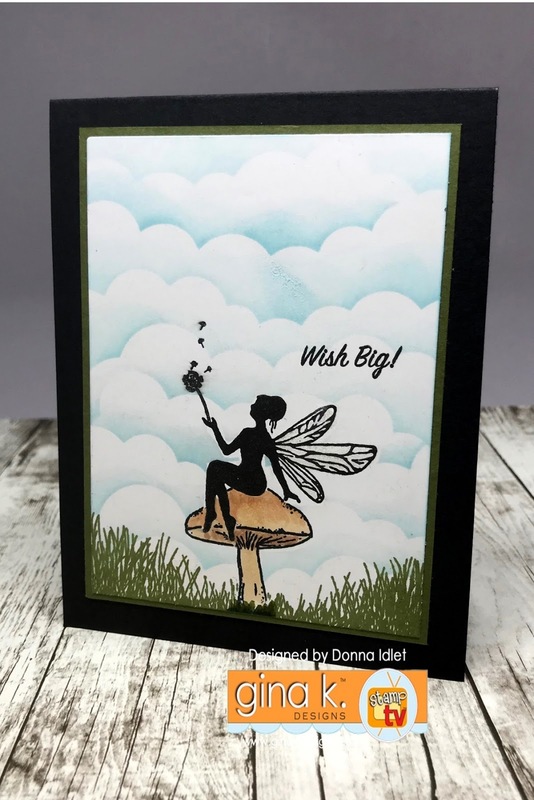 Welcome back to Day 2 of the January Inspirational blog hop, today we will be featuring three new illustrators stamp sets, the first one is Theresa Momber- Illustrator of "Framescapes- Enchanted Garden", the second one is a new illustrator to the Gina K. Family Lisa Hetrick- Illustrator of "You Are" and lastly Claire Brennan- Illustrator of "Geo Thanks". Sit back and enjoy all the creations from the Design Team! 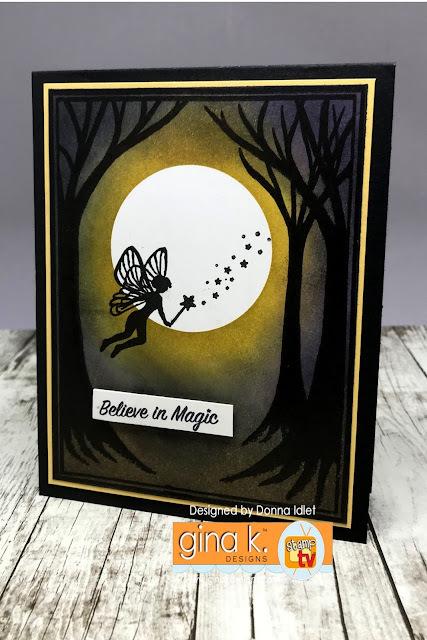 Stamps: Framescapes- Enchanted Forest Illustrator Theresa Momber. Thank you so much for stopping by, I hope you have been inspired! 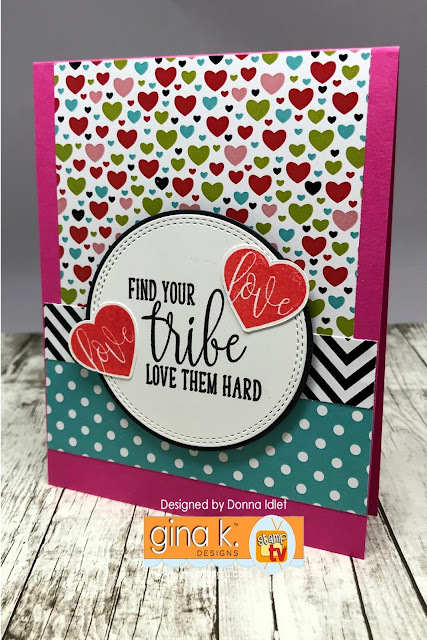 For more inspiration, below is the blog hop list, please stop by and leave a comment on each blog for your chance to win a $25 gift card to the Gina K. Store. 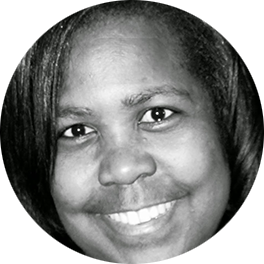 I am so happy to be back with Retro Rubber Challenge Blog Team! 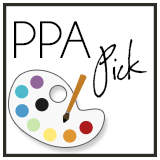 I hope that you all are ready to get creative again for the new year. 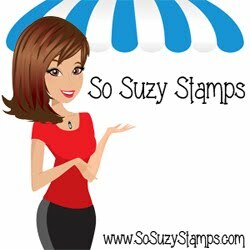 Dust those stamps off that you haven't used in a while or have never used and join the challenges! The challenge is "White Out", your card should be mainly white with an accent of one of the colors on the inspirational photo below. 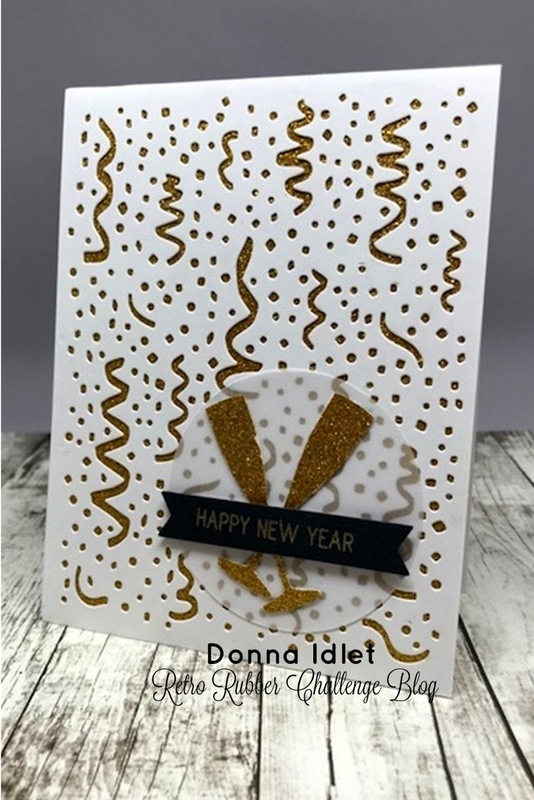 Today I am sharing a "Happy New Year" card. 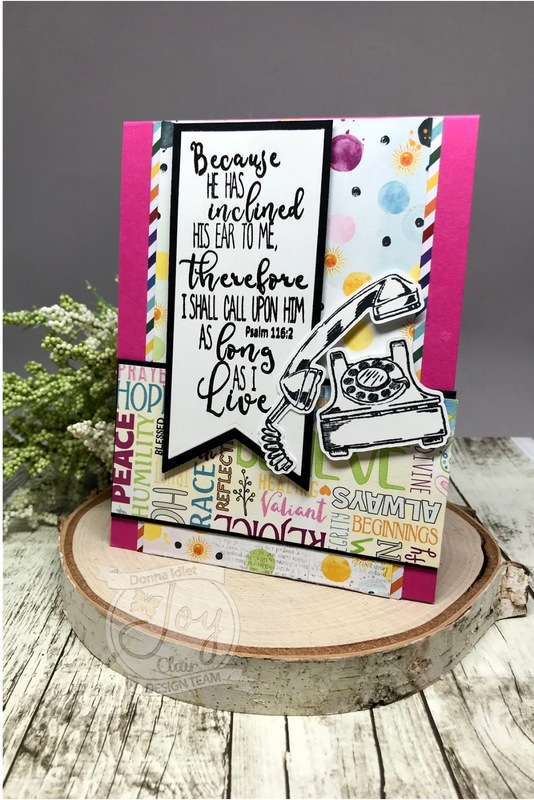 The sentiment I am using is from a Hero Arts Stamp and Cut stamp set called Merry. I believe this set was released sometime in October 2016. 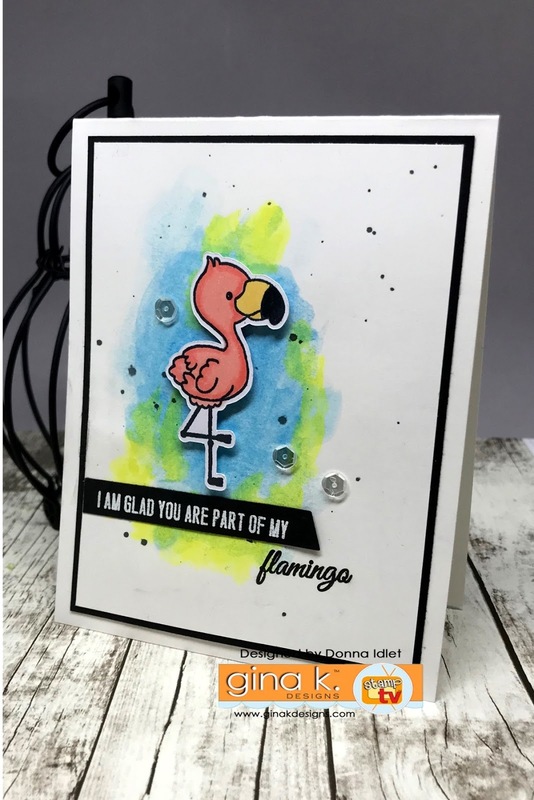 Here is my card, I started out by die cutting the background with the Hero Arts background Party Confetti Fancy Die. I used some gold glitter paper on the back of the die cut. I cut the champagne glasses with my silhouette, I then stamped my sentiment with versamark and used some gold embossing powder. Thank you for stopping by, you have until January 26 to join the fun! 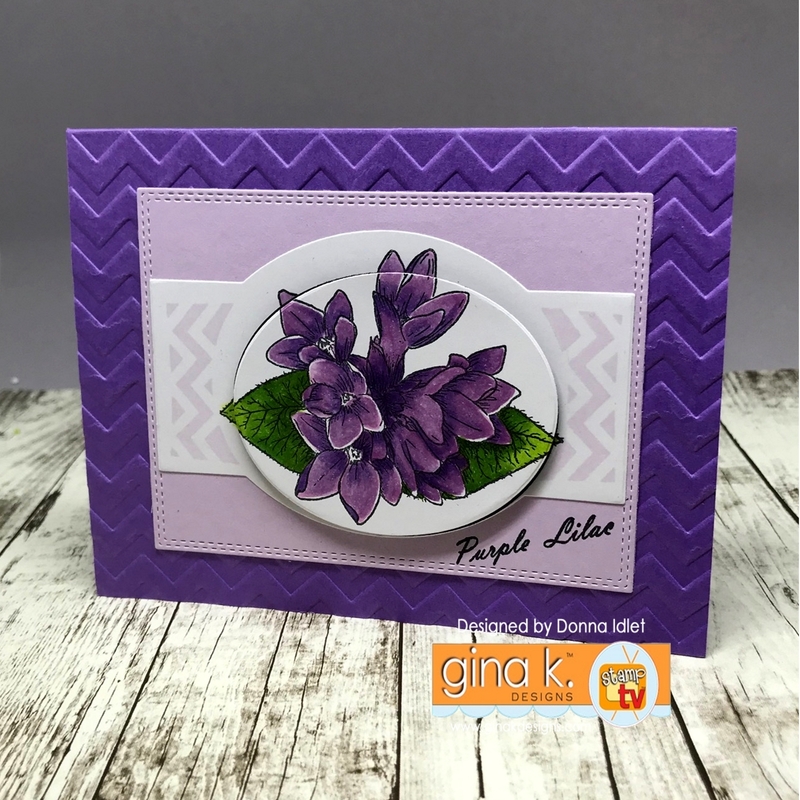 This is my first post for the New Year with Gina K. Designs! I am so excited to be back to share with with you today two new stamp sets one by Melanie Muenchinger - Illustrator of Stately Flower 12 and the other by Beth Silaika - Illustrator of Emmy and Riley Flamingo. 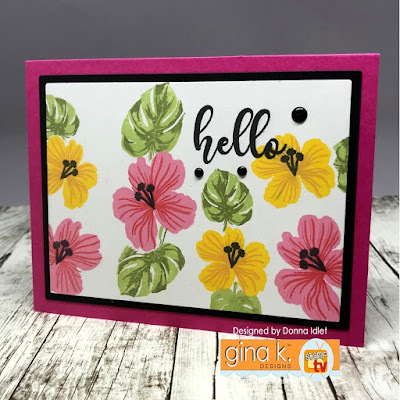 As always Gina K. Designs has a giveaway during the hop! Just comment on each team members blog for your chance to win. 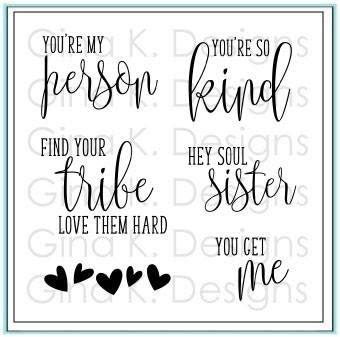 New this year Gina K. Designs will be giving away THREE (yes THREE) $25.00 gift Certificates for the Gina K. Designs store. 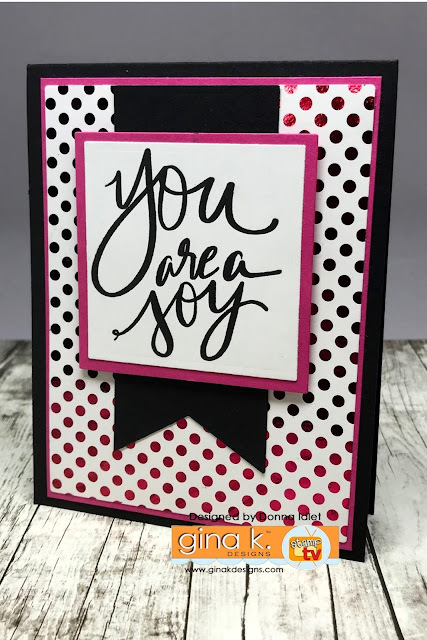 The winners will be announced in the big news over at StampTV a few days after the hop. Here are my cards for your inspiration. Did you miss the Release Party last week? Here are the cards I showed.